These days, Tel Aviv seems to find itself near the top of most internet lists of the best vegan cities to live or—at the very least—visit. In fact, some reports indicate that Tel Aviv has more vegans per capita than anywhere else in the world. Which means that it was time—from March 21 to 27—for five leading vegan bloggers with millions of social media followers to head to Israel for the trip of a lifetime, sponsored by Vibe Israel. Hailing from England and Canada as well as Los Angeles and Miami, participants included Niki Webster of Rebel Recipes; Jasmine Briones of Simple Sweet Vegan; Gaz Oakley of Avant Garde Vegan; Caitlin Ann Shoemaker of From My Bowl; and Jean-Philippe Cyr of The Buddhist Chef. None had a prior connection to Israel, and none of them is Jewish, but they enjoyed a Birthright Israel-style trip curated just for them by the nonprofit that focuses on sharing Israeli culture with the world—especially to non-Jewish, or unfamiliar, audiences. Vibe Israel’s goal for any trip it organizes is to utilize social media to send a message to the world about how tourist friendly, progressive and innovative the Jewish state is. The organization has done this before, leading influential personalities (and, by proxy, their legions of ardent followers) around Israel on themed itineraries, from Internet famous dogs and their owners—including Hadassah’s own Sergio Galdamez and his two chihuahuas, Yeyush and Renzo—to mom bloggers, among them Baby Rabies‘ Jill Krause from Texas. 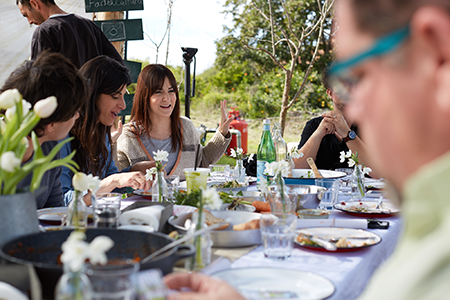 Last year, for the first time, Vibe Israel brought food bloggers to Israel, including Broma Bakery‘s Sarah Fennel. This March trip was its first fully vegan food excursion. While in Israel, the vegan bloggers learned about Israel’s farm-to-table lifestyle and lunched at Farma Cultura organic farm; café-hopped with restaurant critic and local vegan food blogger Ori Shavit; visited Freedom Farm, a free-range animal farm; and attended a cocktail event at PHI, Tel Aviv’s only vegan bar, which also houses a community garden. 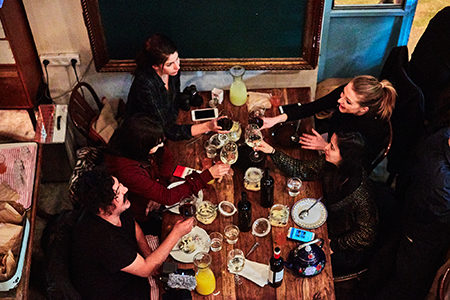 Vibe Israel captured the colorful, tasty travels on camera and plans to include moments from the vegan mission in its official Independence Day video honoring Israel’s 70th birthday. Of course, it would be a shame to visit Israel and miss the sights that hold such significance for the world’s major religions. So in between feasts and dialogue with chefs and farmers, the bloggers explored the Old City of Jerusalem as well as other quintessential first-time tourist spots. Vibe Israel’s hope, once the tearful goodbyes were said and the plans took off, are that these bloggers return home and write enthusiastic posts and share videos and photographs of their experiences in Israel. Love this peace, and the Israeli vegan culture.